“Silent” manual leaf blower + a whole lot more: Power, Performance & FUN! Blow, Sweep, Rake, and Pick-it-all-Up, even Clear Snow from ground and vehicles. Make quick clean up a breeze, on any surface, adding wind power to every sweep & rake stroke. Peace Broom forever changes the way you sweep & rake. No gas, no cords, no noise, no hassle. 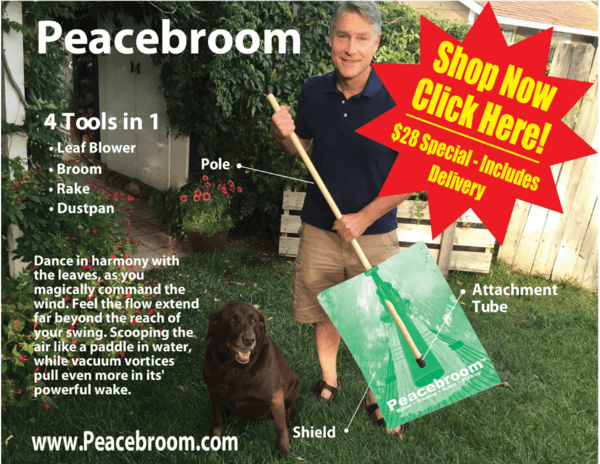 Buy your very own Peace Broom tool(s) today!